Do you have a friend, relative or someone else who is standing as a candidate in Oxford Health NHS Foundation Trust’s Council of Governors election this spring? Would you like to vote for them? To do so, make sure you are a member. Sign up by 16 April 2019 to be able to vote or stand to become a governor in the 2019 election. You will then receive a welcome letter from our CEO Stuart Bell. Before the election you will receive a ballot paper showing the candidates you can vote for. Do I need to do a lot? No – you have no obligations as a member. Am I qualified to become a member? Anyone over 12 years old who lives in Oxfordshire, Buckinghamshire or rest of England and Wales can sign up as a member. If you are a service user or carer, you can sign up to our Patient constituency or to Public constituency. Some of our members specifically want to state they want to be the voice of these groups, and others prefer not to say – it is entirely up to you. All members of staff are automatically members of the trust, unless they opt out. You will receive our monthly email newsletter Membership Matters. It tells you about the latest developments in the trust, the work we are doing and how you can get involved in many a great variety of ways, from volunteering to research and giving your views about our services. You can attend Health Matters, members-only events we organise in various locations across the trust counties. Our latest Health Matters had a theme Art in Recovery, where short talks were followed by art, dance and drama workshops. You can vote in the governor election. You can stand to become a governor. Why does the trust have members? The trust board depends on the membership to keep them in touch with what’s needed in our hospitals and services. 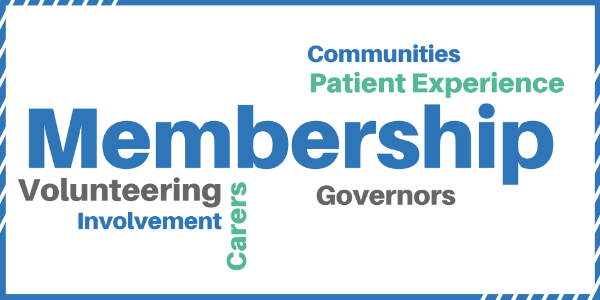 Our membership helps us discover how best to improve services, making sure that we put patients’ and local communities’ needs first.